I have always loved fall with the changing colors and cool evenings, perfect for a big pot of homemade soup! If you are looking for a hearty meal to make this season, try my chicken bean soup. It’s an earthy treat and, unlike many traditional chicken soup recipes, uses a tomato base for extra richness! There is nothing quite as inviting on a chilly day as a steamy bowl of soup. Here in Wisconsin the days are getting cooler and shorter, so I see lots of soup recipes in my family’s future! While you can certainly adapt them for the slow cooker, soups don’t take long on the stove, so that’s how I prefer to make them. Soups freeze really well, so feel free to make big batches to save yourself some time in the kitchen weeks from now. 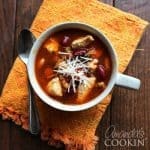 This chicken kidney bean soup is hearty and delicious, and it’s really easy to make. The beans, chicken, and tomato work well together and it’s easily adapted by adding or subtracting different vegetables. It makes a great appetizer but is also hearty enough to serve on its own as a meal with some homemade crusty Italian bread. Perhaps the best part of making this soup is the amazing aroma that will fill your kitchen. It smells (and tastes) like fall in a bowl. A great pick me up after raking all those leaves outside! You’ll find a printable version of the recipe below. What is your favorite variation on chicken soup? Tell me in the comments! If you enjoy tomato based soups, also check out this great tomato soup recipe, or some roasted red pepper tomato soup. For another extra-hearty option, simple corn chowder is a classic the whole family will love. Keeping with the theme of fall cooking, it’s the perfect time of year to try some rustic garlic potato soup. Sausage mushroom wild rice soup is another great autumn dish. For some reason wild rice just feels fall-ish to me! This chicken bean soup is the perfect dish for a chilly fall day! Heat 2 tablespoons of the olive oil in Dutch oven over medium heat. Sauté chicken until no longer pink. Remove chicken with slotted spoon to a bowl and set aside. Add remaining 2 tablespoons of oil to the Dutch oven. Add onion, carrots and celery sauté until they begin to brown, about fifteen minutes. Puree the canned tomatoes in a food processor until no chunks remain. Add pureed tomatoes, broth, both cans of beans, parsley and bay leaf to Dutch oven. Bring to a boil then reduce heat and simmer for 15 minutes. Add chicken and simmer until cooked through, 5-10 minutes. Season with salt and pepper to taste. how many fresh tomatoes instead of a can? Sounds delicious. I will definitely be giving this a try! What size can of tomatoes for the soup??? ?